Savushun chronicles the life of a Persian family during the Allied occupation of Iran during World War II. It is set in Shiraz, a town which evokes images of Persepolis and pre-Islamic monuments, the great poets, the shrines, Sufis, and nomadic tribes within a historical web of the interests, privilege and influence of foreign powers; corruption, incompetence and arrogance of persons in authority; the paternalistic landowner-peasant relationship; tribalism; and the fear of famine. The story is seen through the eyes of Zari, a young wife and mother, who copes with her idealistic and uncompromising husband while struggling with her desire for traditional family life and her need for individual identity. Daneshvar’s style is both sensitive and imaginative, while following cultural themes and metaphors. Within basic Iranian paradigms, the characters play out the roles inherent in their personalities. While Savushun is a unique piece of literature that transcends the boundaries of the historical community in which it was written, it is also the best single work for understanding modern Iran. Although written prior to the Islamic Revolution, it brilliantly portrays the social and historical forces that gave pre-revolutionary Iran its characteristic hopelessness and emerging desperation so inadequately understood by outsiders. Published in Persian in 1969. Savushun was the first novel written by a woman to appear in Iran. Its protagonist, Zari, desires chiefly to care for her husband, raise her children, supervise the kitchen and tend the garden. “If she weren’t so attached to her children and husband, things might be different. The first pick of the fruit, caresses, conversations. affectionate gazes . . . such a person could not take risks.” Simin Daneshvar creates a paradise out of the evocations of the smells and sights of flowers, herbs, Iotions and nuts. Zari’s garden is an enchanted place and she rarely ventures beyond its confines save to do charitable work in nearby hospitals. Rumours of politics and battles are brought to her by gossiping visitors and she gathers more by eavesdropping on her husband, Yusof, and his guests as she brings them their food and their opiumladen hookahs. At first, most of this talk seems distant and uninteresting. but Savushun is a historical novel. though one about recent history, and in time the peace of the garden will be breached and the lives of Zari and everyone she knows will be affected by violent events. Indeed, they will be actors in these events. The setting is Shiraz, in southwestern Iran, in the 1940s. In 1941, Britain and the Soviet Union, concerned by Reza Shah’s pro-Nazi sympathies and worried too about the supply lines to Russia, occupied southern and northern Iran respectively. The demands of the occupying troops for food and other commodities forced up prices and encouraged hoarding. Famine was widespread in 1942 and 1943. Outbreaks of typhus in southern Iran were blamed on the British Indian garrisons. Banditry became widespread in the countryside. All this features in the novel. Above all, the arrogance of the occupiers was resented, and Zari sees that the “civilization” their schools teach is hostile to traditional Persian values. She and her husband listen to Radio Berlin, and there are others in Shiraz who believe that Hitler may be the expected one, “the Imam of the Age”. Daneshvar grew up in Shiraz and doubtless there are elements of autobiography in the story she tells. In 1950 she married Jalal Ali Ahmad, one of Iran’s leading novelists and intellectuals, best known for his polemical essay, Gharbzadagi (“Occidentosis” or “Weststruckness”), a hymn of hatred and a bitter account of the way Iran was being ruined by the import of Western commodities and ideas. Ali Ahmad died (or was he murdered by Savak?) in the year of Savushun’s publication and the novel gives fictional form to some of the concerns of Gharbzadagi. Ali Ahmad had urged his fellow intellectuals to turn away from Europe and find in Iran’s own culture sources of selfrespect. He was inclined, though only halfinclined, to look for future salvation in the religious establishment and traditional Iranian Shi’ism . Daneshvar too seems to be advocating a return to traditional roots, though not to a rigorous religious fundamentalism. Savushun affectionately evokes the old folkways. Zari and her friends keep themselves busy, interpreting dreams, practising bibliomancy with the poems of Hafiz of Shiraz, averting the evil eye with wild rue and concoctingfolk medicines. The title of the novel itself refers to an ancient ritual of mourning in which the participants lament the betrayal and death of Siyavush, a sort of Adonis figure from Iran’s legendary prelslamic past. Just as the hero Siyavush passed through an ordeal of fire, so Yusof, Zari and their country must pass through such an ordeal. Just as Siyavush was betrayed and killed by foreigners, so Iran has fallen among toreign thieves. Yusof is a reincarnation of Siyavush, but he is also, in some respects at leasts Ali Ahmad. Yusof argues and negotiates with tribal leaders, communists, quietists and collaborators. It is clear that he has found his own way, but what that way is (apart from resistance to foreign humiliation) is not so clear. His rather vague ideas on social and economic problems have a fortuitous similarity to those of the Young England group who gathered round Disraeli in the 1840s. Yusof. the romantic traditionalist, is a benevolent landlord to his peasants. He extends a similar protective paternalism to his wife. Zari never ceases to love and revere her husband, but she will in the end break free from the garden in which he kept her captive. Savushun is not the sociopolitical treatise that some of the above may suggest. It is a meandering novel about fallible human beings, who are confused about what is happening and confused, too. about their role in a country which in 1940 (and in the 1960s) had lost its sense of direction. At first, incident follows incident as in an unedited diary. Threads of plot are picked up and dropped, but slowly those threads are drawn together in a phantasmagoric moderndress version of the betrayal and martyrdom of Siyavush. First published in 1969, Simin Daneshvar’s Savushun has gone through sixteen printings and sold half a million copies, a record for a work of literature in modern Iran. The reason is not obscure. Daneshvar’s style is sensitive and imaginative. Her story follows basic cultural themes and metaphors. It goes straight to the hearts of a generation of Iranian readers, striking special chords of emotion and memory of the recent past. 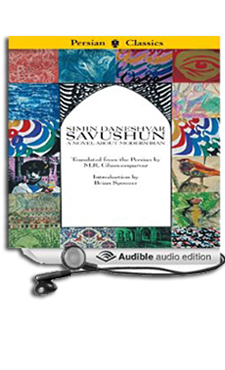 Savushun enriches a generation’s understanding of itself. It encapsulates the experience of Iranians who have lived through the mid-century decades which led up to the 1979 revolution. They feel immediate identity with the major characters, each of whom struggles in their own daytoday lives with the social and historical forces that gave pre-revolutionary Iran its characteristic hopelessness and emerging desperation so inadequately understood by outsiders. The work of translation is long overdue, but may in fact be more successful with Western readers now than earlier. In the 1970s we were too confident in our outsider’s view of Iran to appreciate its full significance. The revolution shattered that view and brought home to us the extent of our outsiderness. Iran today seems incomprehensible to outsiders. This novel helps us to reconstitute our earlier view, to rebuild our dialogue, and to trace the historical and cultural continuity through the 1979 revolution into the present. The translation of such a novel into English presents special problems. If it means so much to Iranians, will the Western reader understand it? Should we expect that any novel could convey a single package of meaning to two culturally distinct readerships especially when it deals with historical events and interests that have recently separated them? Though the work of translation was unusually challenging, I think its success is facilitated, perhaps even ensured, by the humanity of Daneshvar’s central characters. This humanity shows irrepressibly through several passages that are not otherwise directly translatable from one cultural discourse to the other. Although the lives in the novel are so obviously different from Western lives, as nonIranians we also can relate to them immediately and unconsciously to the underlying human nature we share with them, and which the author so sensitively develops in the course of her story. Most of the action takes place in a middle class, landowning household in the town of Shiraz in southern Iran. The events as they unfold are seen through the eyes of the young wife and mother, Zari, whose first concerns, whether unconsciously or consciously, are her children, her husband and the security of her family and household. Much of what she does not experience herself is narrated to her by visitors participating in family situations. The centrality of the life of the family and of Zari within it is a major factor in the book’s appeal. Using the household as a stage, the author weaves a narrative of steadily increasing complexity, involving a variety of situations and personalities that work through the gamut of Iranian collective concerns. The household includes Zari’s maturing son, her twin daughters, her widowed sisterinlaw, and devoted servants. Her principled husband spends extended periods away in their village. Frequent visitors to the household include her ambitious brotherinlaw and headstrong tribal leaders who are in rebellion against the government. Other significant characters include the governor and his family, officers and policemen, and the British (including Scottish officers and an Irish correspondent). But the essential field of action is Zari’s evolving sense of herself and her vacillation between her fears for herself and her family and her respect for her husband’s ideals. She works these out in her personal experience of childbirth and charitable work in a mental hospital and through participation in weddings and contact with disease. The narrative is developed within basic Iranian paradigms of womanhood and married life. Each character plays out the role that is inherent in their personalities. Even divorced from its essential historical context this makes for an unusually good novel. But understood in its context it is a unique piece of literature that easily transcends the boundaries of the historical community in which it was written. Nevertheless, the more we know about the historical web in which these characters live which is an integral part of the consciousness of the Iranian reader, but alien or unknown to us the better we shall be able to appreciate the novel. The major strands of this web are the interests, privilege and influence of foreign powers, corruption, incompetence and arrogance of persons in authority, whether in national and local government, the army or the police, the paternalistic landownerpeasant relationship, tribalism, the fear of famine, and the intellectual appeal of Sovietinspired communism as a way to escape from hopelessness. Other important strands include the implications of the author’s choice of location in and around Shiraz during the Second World War, opium addiction and the interplay of Islamic and preIslamic ideas and rituals. The story’s main concern are the years between 1941 and 1945. Iran had been occupied by the British and the Soviets, joined later (in 1945) by the Americans, because it sat astride the supply lines from India and the Middle East to the Soviet Union. The Allies considered the occupation necessary because they could not afford to allow the possibility of German activity in the area. Many influential Iranians were ready to collaborate with the Germans in order to counteract the suffocating dominance of British and Russian interests that had become a fact of life. The Russian expansion through the Caucasus over the past hundred years had become a threat to Iranian interests towards the end of the eighteenth century under Catherine the Great. Later, in 1828, the Treaty of Turkmanchai set the tone for the next 150 years by forcing Iran to cede most of her Caucasian territory and to grant extraterritorial rights to Russians on Persian soil. Meanwhile, the British were anticipating the extension of Russian interests towards India and from the beginning of the nineteenth century actively sought to dominate Persian foreign policy and to influence the Persian economy. Since then competition between Russia and Britain (since 1947, between the Soviet Union and America) has dominated Iranian political life. All the modern borders of Iran were drawn by Russian and British teams during the nineteenth century, with only minor revisions since. In 1907 Britain and Russia concluded an agreement whereby they avoided direct competition with each other by dividing Iran into zones of influence for the purpose of commercial development. This caused outrage in Iran, although it made little difference to the existing state of affairs. In 1941 Britain occupied the south while the Soviets occupied the north. Reza Shah Pahlavi, who since 1925 had achieved a measure of success in extricating the country from its economic and political dependence, was forced to abdicate in favor of his son (who reigned until 1979). From 1941 to 1945 Iran was reduced to the most abject state of dependence of its modern history while still nominally retaining its own independent government under the young Shah. The occupying powers subordinated everything to the economic and political objectives of supplying the eastern front and winning the war, with disastrous results for Iran’s small economy. The worst of the results was widespread famine, especially in 1942-1943, triggered by a poor harvest the previous year. Existing extremes of poverty were exacerbated, disease rates increased, and typhus became a chronic problem. Corruption, incompetence and arrogance characterized almost anyone in authority, in national and local government, the army and the police. The influence of the occupying powers had a Christianreligious extension in the south, and a communistideological extension in the north, both of which were socially disruptive. In particular, the Soviet presence encouraged the formation and development of the Party of the Mass (Tudeh), a political party which found appeal among middle class urban intellectuals. All of these factors are significant in the novel. Apart from these results of external influence, the author makes excellent use of purely internal factors. The southern town of Shiraz, which provides the setting for the story, is more than any other town central to Iranian historical identity. It evokes images of shrines and Sufis, of the tombs of the great poets, of Persepolis and the great monuments of preIslamic Iran, and, in the hinterland, of the nomadic tribes. It is not easy to convey in a few sentences the significance of tribalism in the Iranian consciousness. Iranian writing has exaggerated the fear and dislike of the city dweller for the “uncivilized.” This is somewhat overcompensated for by the work of anthropologists, who have provided monographs on particular aspects of the tribal experience, but none summarizing the significance of this other way of living for the society as a whole. Historically the tribes have represented the spontaneous organization of populations that were not controlled by any central or urban government. When the government was weak tribes often terrorized the countryside. In the early part of this century tribal leaders played a significant role at the national level. However, since they are essentially the antithesis of strong government, Reza Shah made a special point of bringing them under control. He did this by depriving them of their economic resources, and by forcing them to settle. On his abdication the leaders escaped and within weeks the tribesmen were back on the migration trail. The Qashqa’i confederacy, which was the most powerful in the Shiraz area, was proGerman and kept a German military adviser for a while until they found that he could not deliver the arms they wanted. There was sporadic fighting throughout the period of the Allied occupation. All this is there in the novel. Against this background–corruption, disease, famine, insecurity, and foreign dominance–provincial life continues. Everyone works out their own daytoday lives. The demoralization is evident in the exploitation of any position of power, by the governor and his family, by petty officials, in the arrogance and incompetence of army officers and of the paramilitary gendarmerie. Socialist ideas provide hope for the young. Opium offers an option for the old. But Zari’s husband, Yusof, who is the hero of the work, displays a calm, responsible, human decency. He is accused of idealism, but is never fanatical. He is a landowner but treats his peasants fairly and with no more paternalism than is inherent in the system. He is frustrated by the indecency and injustice around him, but he stands firm against the timeserving maneuvers of his brother and others, who see no point in making things worse for themselves for the sake of abstract principles and with no prospect of any return. Savushun, the title of the novel, is a folk tradition, surviving in southern Iran from an undatable preIslamic past, that conjures hope, in spite of everything. It is evoked in some detail in the final pages a metaphor for the flame of idealism against a backdrop of hopelessness and helplessness, a basic metaphor that is found in many traditions, religious and secular. In Iran over the centuries it has become entangled with the Shi’a Muslim passion of Hoseyn, the Prophet’s grandson, and the tragedy of Karbala. It suggests the transformation of hopelessness into salvation. This is the essence of Iran, with no compromises, in a novel of universal appeal. It was the wedding day of the Governor’s daughter. The bakers had put their heads together and baked a loaf of flat sangak bread the likes of which had never been seen before. In groups guests came to the wedding room to see the bread. Khanom Zahra and Yusof Khan, too, saw the bread up close. When Yusof’s eyes caught sight of the bread, he said, “Stupid cows! How they kiss their butcher’s hand! What a waste! And at a time like this . . .” Those nearby who overheard Yusof first edged away, then left the room altogether. Zari stopped herself short, took Yusof by the hand and, with pleading eyes, said, “For God’s sake, can’t you let me breathe in peace, at least tonight?” Yusof smiled at his wife, as he always did, spreading his pursed purled lips to show his once sparkling white teeth, now stained by years of smoking the hookah. Yusof walked away, but Zari stood there, staring at the bread. She leaned over and lifted the corner of the handprinted tablecloth, which hid two wooden doors stuck together. Around the borders of the cloth, in floral and paisley patterns, were trays of wild rue and figures of the legendary lovers, Leyli and Majnun. In the very center sat the reddish loaf of bread, decorated with a poppy seed inscription: “To our benevolent Governor-from the Bakers Guild.” Along the sides of the bread, “Congratulations” was written over and over in saffron and nigella seeds. What an oven they must have needed! Zari thought. What a mound of dough! How much flour they must have used! And, besides, as Yusof said, “At a time like this!” At a time when this single loaf could make a whole family’s evening meal. At a time when to get bread from a baker you need to be a hero like Rostam. Lately the rumor had spread through the city that the Governor had threatened to throw a baker into his oven, to set an example for the other bakers. Anyone who bought bread from that baker came down with severe stomach cramps, writhed in pain like a wounded snake, and vomited as if stricken by the plague. They said that his wheat had so much darnel in it that his bread was as black as ink. But then, as Yusof said, “Were the bakers to blame?” The city’s food supplies, from onions to wheat, had been bought up by the occupying army, and now . . . How can I ever convince those who heard Yusof to pretend they didn’t . . . ? She was still lost in her thoughts when a voice broke in, “Hello.” She raised her eyes from the bread to see Khanom Hakim, the British doctor, standing next to Sergeant Zinger. They all shook hands. Both the foreigners spoke Persian, although a broken Persian. Khanom Hakim asked, “How the twins have been?” and explained to Sergeant Zinger, “All three children by my hands have been delivered.” The Sergeant retorted, “I could never have doubted that.” Then she asked Zari, “The child still has been on a pacifier?” Khanom Hakim said so many “have beens” and “had beens” that she even wore herself out. Afterwards she said some things in English Zari did not follow, even though she had studied at the British school and her late father had been considered the best English teacher in the city. Her mind was elsewhere. Zari had heard it but couldn’t believe it, until she saw it with her own eyes. The present Sergeant Zinger was none other than the former “Mr. Zinger,” the Singer sewing machine salesman. He had come to Shiraz at least seventeen years ago, and still did not speak good Persian. With every sewing machine he sold, this giant corpulent man gave ten free sewing lessons. Maneuvering his weight behind the sewing machine, he would teach young girls the fine points of embroidery, eyelets, and double pleats. Curiously enough he never once chuckled at the figure he cut. But the girls learned well, Zari too. When the war began, Zari heard that Mr. Zinger had overnight donned the braids and stars of an officer’s uniform. Now she saw that his sergeant’s uniform suited him well. She thought, What self control he must have had to live with these lies for seventeen years. A fake profession, fake clothes, all lies, from head to toe. And how skillful an impostor he was at his job. With what cunning he made Zari’s mother buy a sewing machine. Other than her husband’s pension, Zari’s mother had no other income. Mr. Zinger had told her that a girl with a Singer sewing machine in her dowry needed nothing else. He said anyone who had a Singer sewing machine could even make a living with it. He claimed that the rich and the noble in the city had all bought Singer sewing machines as part of their daughters’ dowries and then showed Zari’s mother a book in which he had recorded the names of his most noteworthy clients. Three Scottish officers with pleated kilts and women’s stockings joined them. Then, Yusof’s friend MacMahon, whom Zari had seen many times, came in. MacMahon was an Irish war correspondent who carried a camera around. He asked Zari to explain the wedding layout, and Zari launched into a description of everything: the silver flower vase and the candelabrum and mirror; the shawl and ring wrapped in cashmere, the bread and cheese, the green herbs and wild rue . . . and the two large sugar cones placed at each end of the tablecloth, which were especially made at the Marvdasht sugar factory for the Governor’s daughter’s wedding. One sugar cone was dressed in a bridal gown, the other in a groom’s outfit and a top hat. In the corner of the room was a baby carriage, covered inside with pink satin and filled with candy and coins. Zari lifted a cashmere cloth from the horse’s saddle and said, “The bride sits on the saddle so she will always be riding her husband.” Everybody laughed and MacMahon clicked pictures. Zari noticed the Governor’s younger daughter, Gilantaj, motion to her. She excused herself and walked over to the girl. She had honey colored eyes and straight brown hair that touched her shoulders. She wore short stockings and a skirt that reached above her knees. She must be the same age as my Khosrow, no more than ten or eleven, thought Zari. “My mom asked if you could please lend us your earrings,” Gilantaj said. “My sister will wear them just for tonight and tomorrow they will be returned to your house . . . It is Khanom Ezzatoddowleh’s fault; she brought a green silk braid for the bride to wear around her neck. She says green brings good luck. But my sister has nothing green to go with it.” Gilantaj recited her lines like a school girl. Zari was stunned. How were her emerald earrings spotted and singled out? Who ever thought of mixing and matching apparel for the bride in the middle of all this commotion? Probably something Ezzatoddowleh cooked up. With those crossed eyes of hers, she spies on everyone in the whole city and keeps track of what they own. Her voice trembling, she replied, “These were a gift on my wedding night, a memento from my motherinlaw.” She remembered the night in her bridal chamber. Yusof put the earrings on her ears with his own hands. Amidst the hullabaloo and the commotion, before the eyes of all the women, while sweating, Yusof had trouble finding the holes in her earlobes. The crude women had jumped at the opportunity to repeat the proverb about ears being pierced in the father’s home and what happens in the husband’s home. Impatiently, Gilantaj said, “They’re playing the wedding song. Hurry up. Tomorrow morning.” Zari removed her earrings. “Be very careful with them. The pendants might fall.” If hell froze over she would see her earrings again. She knew all right, but how could she refuse to hand them over? The bride now entered the room for the wedding ceremony. Ezzatoddowleh was holding her arm. It was amazing how every time a new governor came to the city Ezzatoddowleh wormed her way into the family as a friend and adviser. Five little girls in frilly dresses looking like little angels, each carrying a bouquet of flowers, and five little boys in suits and ties followed the bride. The room was packed. Ladies applauded. The foreign officers were still in the room. They too applauded. After all, the show was put on for them. For Zari, this pageant was like a procession in a passion play. The wedding song was being played. The bride sat on the saddle in front of the mirror, and Ezzatoddowleh rubbed the two sugar cones together over her head. With a needle and red thread, a woman pretended to sew up the lips of the groom’s relatives. The foreign officers chuckled. A black maid like a genie appeared in the room, carrying a charcoal brazier in which wild rue seeds were burning. But the room was so crowded that no genie would have fit in. All the villains of the passion play are here, thought Zari. Marhab, Shemr, Yazid, The Frank, Zeynab the Unwanted, Hend the Liver Eater, Ayesheh, and this last one, Fezzeh. Suddenly it dawned on her: I’m beginning to sound like Yusof. The room was warm and permeated with the smell of wild rue, tuberoses, carnations, and gladiola, which could been seen in large silver vases here and there between the ladies’ skirts. The flowers were brought from the Khalili Garden. Zari did not hear the bride say, “Yes,” giving her consent. Gilantaj touched Zari’s arm and whispered, “My mom said thank you. They look good . . .” The rest of what she said was lost amid the cheers and the loud and discordant military march which followed the wedding song. It sounded like battle drums were being played. Ferdows, the wife of Ezzatoddowleh’s doorman, elbowed her way up to her mistress. She handed Ezzatoddowleh her purse. The mistress opened it, pulled out a bag of candy and silver coins and showered them over the bride’s head. And, so that the foreign officers would not have to bend over, she handed them each a coin. She also gave one to Khanom Hakim. Up until then, Zari had not noticed Hamid Khan, but became aware of his presence when he began to talk. Addressing the foreign officers, he said, “My mother’s hands will bring good fortune and luck-” Then, turning to Zari, he asked, “Khanom Zahra, please translate for them.” Her former suitor! You wish! Zari thought. I had enough of you when the history teacher dragged all the ninthgrade school girls to your house under the pretext of showing them a historical monument, and you checked us up and down with your lewd eyes and showed us your bathhouse and exercise room, constantly repeating that your grandfather, the grand police chief, built the mirror hall, and Lotfali Khan had the mirrors painted . . . And then how rudely your mother came to the Shapuri public bath on our bath day, intruding in our private cubicle, to look at my naked body with those crossed eyes of hers, checking me over. Luckily, though, Yusof had already asked for my hand. Otherwise, my mother and brother may have been fooled by your pretentious lifestyle. Following the wedding ceremony, the celebrations began in the courtyard garden and on the front veranda. They had decorated the cypresses, ornamental palms, and sour orange trees with lights, each tree a different color. Large trees with large light bulbs and small trees with small ones. Just like stars. Water flowed down the two sides of the stairs leading into a pond. A roseshaped light glowed in the middle of every step and water passed over its red reflection and poured into the pool. The large garden patio was carpeted for dancing. Zari figured that the wiring for the lights in the waterscape was hidden under the carpets. Large, ornate china bowls full of fruit, candelabra with three branches, and baskets of flowers were arranged alternately all around the pool. The candles on the candelabra were lit, and as soon as one was blown out by the breeze, a servant would immediately relight it with a shorthandled torch. The Governor himself, tall and broadshouldered with a white beard and mustache, stood by the side of the pool welcoming the guests. The last to arrive was a crosseyed British colonel, who entered hand in hand with Zari’s former headmistress. They were accompanied by two Indian soldiers bearing a basket of carnations shaped like a ship. When they reached the Governor, they put the basket down by his feet next to the pool. The Governor, who was busy kissing the British lady’s hand, did not notice the flowers. He shook hands with the colonel a second time and then stretched his hand to the Indian soldiers, who clicked their heels, saluted, turned about, and left. The military band was playing a march. Then the other musicians arrived. Ne’mat played the zither, a potbellied man played the tar, and a boy who had plucked his eyebrows sang, “My flower, my flower, my silverbraided beloved,” and danced. Afterwards he sang, “My darling, you are a willow leaf, a willow leaf.” Then they played the drums and a few men and women in borrowed Qashqa’i costumes did a poor imitation of a handkerchief dance. Zari had seen all sorts of fake things but had never in her life seen counterfeit Qashqa’is. Now the musicians, who had come all the way from Tehran just for this wedding, had their turn. To Zari’s ears, their tunes sounded all muddled. The mere sight of the large platters of cookies and pastries and bowls overflowing with mixed nuts made her stomach turn. It dawned on her that the first platter had probably been sent by the pastry guild and the second by the nutsellers guild. The fivetiered wedding cake, flown in by an airplane, was a gift from the Head Command of the Foreign Troops. The cake was placed on a table on the veranda. A bride and groom were standing hand in hand on its top layer. Behind them was a British flag. Everything was made of pastry. The whole scene seemed like a movie, especially with all the foreign officers in uniforms adorned with braids and medals, Scottish soldiers with pleated kilts, and several Indian officers with turbans. And if Zari hadn’t lost her earrings, she may have even enjoyed the spectacle. First the bride and groom danced. The long train of her gown dragged over the carpet like the tail of a shooting star, the stones, glass beads, and pearls sparkling in the lamplight. But she was wearing neither the green silk braid nor the bridal chiffon. Only the earrings were in place. The bride danced once with the British colonel and then with Sergeant Zinger, in whose arms she looked like a vulnerable little creature. It seemed that he even stepped on her feet a few times. Then the foreign officers approached the other ladies. The women, in their colorful dresses, were dancing in the arms of strangers, the officers, while their husbands sat on the sofas and watched. The men looked like they were on pins and needles. Perhaps they were happy. Or maybe they were mad as hell. You never know what is going on inside somebody else’s mind. At the end of every dance, the officers brought the ladies back to their places, as if they couldn’t go back on their own. Some officers clicked their heels and kissed the women’s hands, which prompted their husbands to jump up and quickly sit down again-somewhat like a spring that had been wound up. MacMahon was the only one who didn’t dance. He just took pictures. Sergeant Zinger walked over to Zari, clicked his heels loudly, bowed, and said, “Shall we dance?” Zari excused herself. Zinger shrugged his shoulders and went to Khanom Hakim. Zari looked at her husband, Yusof, who was sitting a few chairs away. Yusof’s eyes, darker than the clear sky of these spring days, were fixed on hers. He winked at her and made her feel warm inside. Yusof always seemed to have a teardrop hidden in his eyes, like two moist emeralds, like the emeralds in her earrings. She was getting up when MacMahon appeared, goblet in hand, and sat next to her. He took Yusof’s hand. He had had so much gin that he could barely keep his eyes open. He asked in English, “Did you lock horns with the tailor general again?” He sighed and continued, “It is more difficult for you, not that it will be easier for us. Did you like the poem that I read to you early this evening? Did you? Now, I’m considering writing a poem about your city.” He pointed to the slice of lime in his goblet and said, “The lime, with its delicate green skin and odor that combines all the scents in the meadow, and the cypress, so freespirited and restrained, are among the major plants in this city, and humans must naturally resemble the plants of the region in which they are born. Delicate and restrained. They have sent me to ask you why you are not delicate and moderate. I am making good progress, Yusof, even though I am dead drunk! How well you accomplished your mission, oh Irishman, everdrunk poet!” And looking at Zari, he said, “To your health.” He took a sip and placed the goblet on the table. “Get up,” he continued. “Let’s go over there and sit on that bench next to that ship of flowers which has anchored at the grassy shore. Zari, you come too. The presence of a beautiful woman is always exciting. This warship with its cargo of flowers is a gift from the General Command of our troops. “Now that’s better. Where is my glass? Zari, fill our glasses. “We are kin, aren’t we, Iran and Ireland? Both are the land of Arians. You are the ancestors and we the descendants! Oh, our old, old ancestors. Give us solace. Give us solace! Oh, Catholic Irishman, the patriarch, the ever drunk! I know that in the end, one day, on a lousy rainy day, you will fall into a ditch and die, or in a poorhouse look for an old woman to call “mother!” Well, your mother and the neighbor girl who brought your mother a glass of warm milk . . . your mother was knitting woolen argyle socks for her son at the front . . . like the ones I have on. Your father was a night watchman in charge of the bomb alert siren; he knew that airplanes drop bombs in our neighborhood, and he knew that our house was about to be hit by a bomb and knew that mother was knitting woolen argyle socks for her son at the front. When they pulled her out of the rubble, she was still holding her knitting needles, and now father has sent a letter. He has written that he is sorry that . . . he is sorry that . . .
MacMahon took another sip, and said, “This is the end of Mina’s story. Say, `Well done,’ Yusof. What a story I’ve made from a few fabricated and real things you reported from your twins. You said the people in your city are born poets. You can see that the people of Ireland are the same.” And he became silent. “But my peasants and the people of my city can be kept hungry,” Yusof said bitterly. When they got home, Zari sat on the bed. She took off her shoes. Yusof was straightening his pants on the bed to put them on the clothes hanger. After he put on his pajamas, he went to the next room, which opened to their bedroom. Zari could see him from where she was sitting. He was standing by the twins’ bed, watching them. Then he moved out of sight, but she knew that he was straightening the pillows. He would take Zari’s keys, which they had hidden between their pillows. She knew that he would kiss them and that he would say, “My cutie dolls.” When she heard the door, she knew that Yusof had gone to Khosrow’s room. She knew that he would pull up his cover, kiss his forehead and say, “My son, if I don’t succeed, you will. You are dearer to me than my life. If I don’t see you one day, I’ll feel like a chicken with its head cut off,” or words to that effect. “Did you understand it all?” asked Yusof. “Yes, I’ve gotten used to his Irish accent,” she replied. Zari laughed. “The child is right. Two stars shine in the depths of your eyes. Your eyes . . . God protect them, are like emeralds.” She couldn’t finish the rest of the sentence. She turned off the light so Yusof couldn’t see the scars on her belly. Yusof said these scars looked like a map. He would kiss the stitch marks and say, “You have suffered all this for me.” Khanom Hakim had stitched up her belly like a wrinkled tablecloth. When she came to the bed, Yusof’s warm, hairy legs touched her own cold legs. His large hand caressed her breasts, and as it reached lower, she forgot everything-the earrings, Sergeant Zinger, Khanom Hakim, the bride, the marchers and the drums . . . the crosseyed and the bald in the wedding ceremony . . . she forgot them all. But in her imagination, she could hear the quiet flow of water from a waterscape over bright red flowers, and she could see a ship full of flowers which was not a war ship.